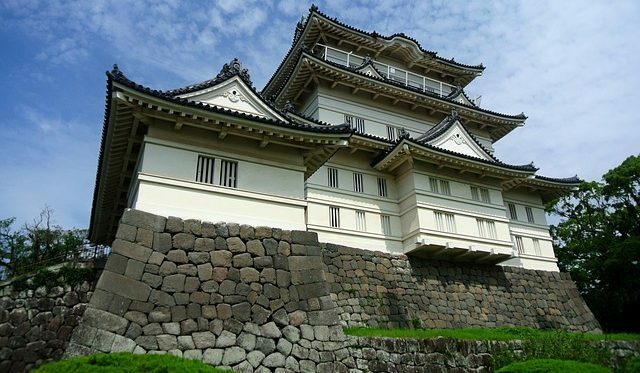 Odawara Castle (小田原城) was originally built back in 1447 by the Omori clan of Suruga who were later defeated by Hojo Soun, the founder of the Odawara-Hojo clan in 1495. The Odawara-Hojo clan grew to become one of the most powerful clans in Kanto region during the Sengoku (warring states) period. It was attacked by both Uesugi Kenshin and Takeda Shingen in 1561 and 1569 respectively, both of which were unsuccessful. In preparation for the upcoming battle with Toyotomi Hideyoshi, the defences of the castle was expanded in 1587, adding a 9km long wall. The Odawara-Hojo clan was forced to surrender in 1590 during the third Siege of Odawara which also saw the end of the Sengoku period, and Toyotomi Hideyoshi awarded the castle to Tokugawa Ieyasu.